The SS President Coolidge was built in 1931 as a cruise and merchant ship. From 1940 to 1942 it was used by the US military to evacuate citizens and transport troops. In 1942 it was finally converted into a true troopship and equip with guns. 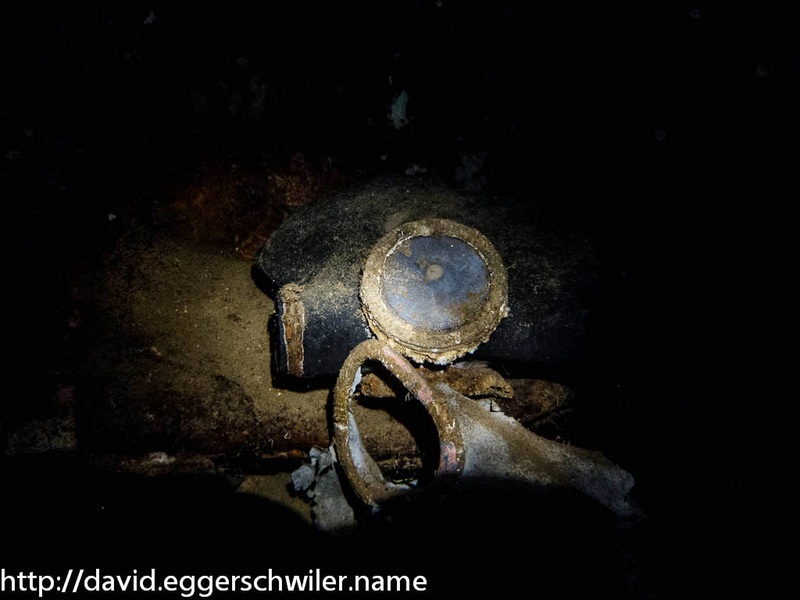 On 26 October 1942 it hit two friendly mines when navigating towards Luganville in Espiritu Santo. The captain tried to beach the ship and almost everyone could be safely evacuated. However, because a coral reef was in the way, the ship ended up slipping back into the water shortly afterwards. Nowadays, it lies on its side in shallow water and offers perfect conditions for divers. This was the main reason why I traveled all the way to Espiritu Santo. Once in town I hooked up with Allan Power Dive Tours. Allan Power, now retired from diving, is the leading expert on the Coolidge, with over 15'000 dives logged. I was lucky enough that it was reasonably quiet at the time so I got a personal dive guide for most of my dives and thus we were able to explore the wreck to its fullest and slowly extend my experience with deep dives. 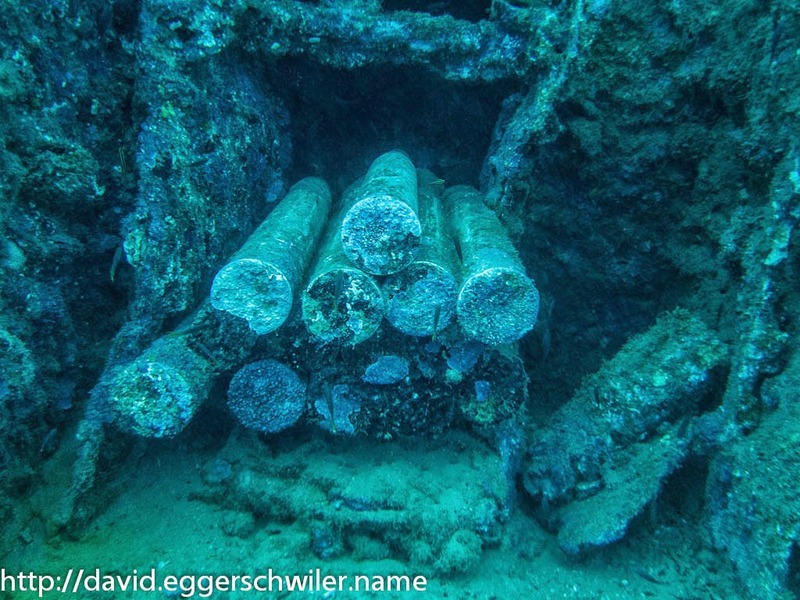 Even though the wreck starts at 15 meters, the interesting things are normally to be found close to or past 40 meters. After an intriguing introduction dive where we stayed on the outside and looked at the different guns the Coolidge was equipped with, we ventured on our first penetration dive to visit The Lady. The Lady is a porcelain sculpture that was originally located in the dining room and is now in a more accessible spot for divers. The next step was a visit to the engine room at 46 meters, where we could still see the gages set for full steam ahead. Venturing deeper we visited the outside pool at 54 meters, which has an interesting mosaic floor, but which gave me some trouble counting all the different colors used ;). 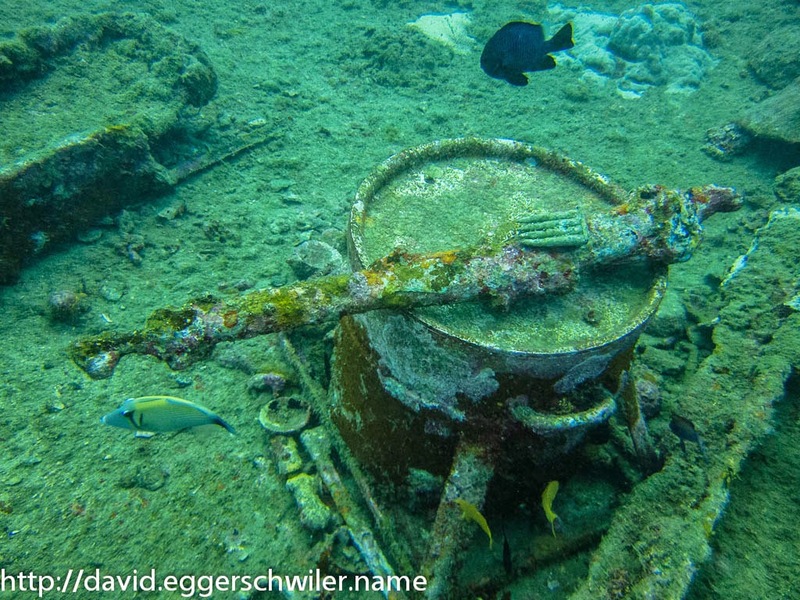 Since that dive went well, we ventured into the Galley, which is located at 55 meters, where a large number of China bowls were still present, together with three huge cooking pots. A short visit to Cargo Hold 6 & 7, revealed an immense spare propeller blade and boxes of ammunition, and set a new depth record of 56.9 meters. Another highlight of the Coolidge are it's night dives, where you venture into Cargo Hold 2 at 30 meters without lights to see a spectacular show displayed by Flashlight Fish. It felt like being in a disco :). My last dive day brought it all together. We swam on the surface until the end of the ship, where we descended and were greeted by the two resident Hawksbill Turtles. We then entered Cargo Hold 7 and progressed inside the ship past Cargo Hold 6, the Galley, Cargo Hold 3, B- and C-Deck and out through the Chain Locker. Completing a 200 meters inside traversal of the whole wreck with a maximum depth of 58.4 meters. Once we exited the wreck my computer showed 26 minutes deco time after 26 minutes diving, and it took 53 minutes until we were clear to exit the water. 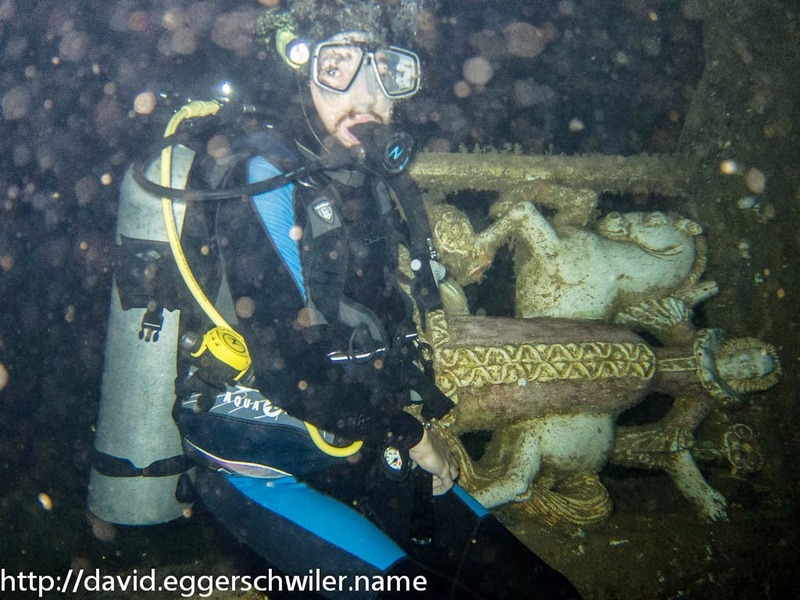 I had a fantastic time diving the Coolidge and would like to thank Allan Power's team for making it such a memorable experience! Unfortunately, my underwater housing only goes to 40 meters, so I don't have too many pictures of these dives, but the pictures I have can be found in this web album.